The Most Fun 8 Watts Per Channel You'll Ever Hear! There is a coherence to the single ended triode design that is tough to ignore. Passing the signal through a single triode in the output stage has a grain free purity that will have you converted in no time at all. Critics around the world raved about the original version of this amplifier (Priced at $1,295) and though I haven't had any personal time with the original, every other Coincident product I've auditioned or owned has been a top of class product. The current Mk. II version is now $1,495, and has had nearly every component beefed up. Bigger transformers, bigger capacitors, more power supply capacity, etc., etc. And the chassis is beautiful. As Coincident's owner Israel Blume comments, "While far more costly than chromed steel, stainless steel is non-magnetic, eliminating hysteresis distortion and the mirror finish is permanent = unlike chrome, which is prone to pitting and eventual peeling." This is not only a component you want to put front and center ? proudly, it?s a component you will probably hand down to a family member. Heading straight for the female vocal tracks, Anja Garbarek's Smiling and Waving proves a revelation, with Ms. Garbarek's voice materializing between the two Coincident Dynamite speakers that have been sent along to review. My other favorites, Ella Fitzgerald, Shelby Lynne and Anne Bisson all seem to just walk out from inside the speakers in such an effortless, grain free, natural way. Even though they have a sensitivity rating of 90db/1-watt, the Mk. II drives them with authority. It feels more like a 20 or 30 wpc amplifier, and my old Dynaco Stereo 70 (30wpc on a good day) runs out of steam quicker than this 8-watt per channel wonder. It?s amazing what solid vacuum designs coupled with modern manufacturing can produce. The Dynamo SE34 Mk. II takes a slightly different approach to the SET thing, using a single EL34 pentode, configured as a triode, with a single EL34 per channel in the output stage, driven by a 6SL7 tube. These days, a good supply of EL34s are available as new stock tubes and the Mk. 3 sounds great as it is right out of the box. When asked about this seemingly off the beaten path choice, when so many SET amplifiers are built around a 300B or 2A3, he replies, "the EL-34 is widely available, inexpensive, and has exceptionally low distortion when used in single-ended triode mode. Most importantly, this tube has wide frequency response, offering a highly transparent and neutral tonality." The proof is in the listening. Removing my $20,000 Nagra 300B amplifier from the system and replacing it with the Mk.II doesn?t reveal a delta of $19,000. Much as I love the Swiss brand, the truth is in the listening. And with a couple of super high efficiency speakers in the system, I prefer the Coincident amplifier. While this is essentially a budget amplifier from a price standpoint (though not in performance) it may not make sense to someone to invest in another $500 or more in NOS tubes. The Mk. 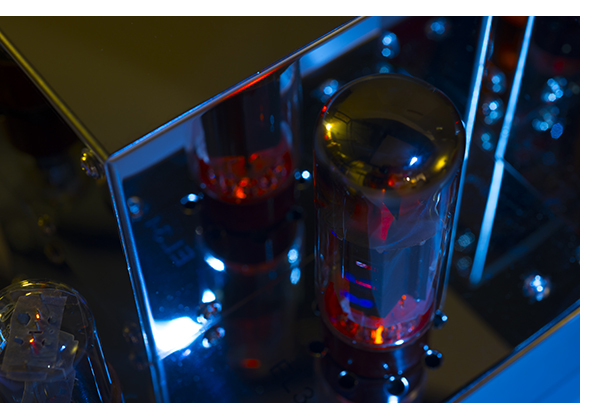 3s small tube compliment (2 - EL34s, 2-6SN7s and a 5AR4) makes this amplifier a tube rollers delight. Seeing I just happened to have some great Siemens NOS EL34s hanging around, as well as the other two, it was worth investigating. To make this clear, the Mk.II sounds fantastic out of the box and like some tube gear I've heard, it does not need a set of vintage tubes to make it sing. However, thanks to the Mk. II being gentle on tubes to begin with, investing in a few NOS tubes can be fun and rewarding. Think of it as replacing the Pilot Super Sports on your car with Cup 2s, or for those of you that aren?t auto enthusiasts, the icing on the cake. Music lovers just playing vinyl or digital exclusively, can use the Mk.II as your sole component, as it has a single pair of RCA, line level inputs - no preamplifier is required. Most of the listening tests conducted running the dCS Rossini DAC/Clock straight into the Mk. IIs line level input went great connected directly. When switching between multiple source components, the Pass XS Pre was used. That these are 40 and 65 thousand dollar components speaks volumes as to how much music this diminutive box reveals. Thanks to auto bias, the output tubes won't need much attention. Combining this with the soft start function of the tube rectifier, tube life should be excellent, as it is with the rest of the Coincident product line. All wiring is point to point, so even if something should ever fail, repairs will be easy to troubleshoot and easy to diagnose, just as the best vintage components from Marantz and McIntosh are. Have you ever met one of those scrappy little dogs that thinks he's a big dog? That's the Dynamo; this amplifier has a huge heart. Though a single ended design, this amplifier is affected far less by speaker and crossover loading than any other SET I've lived with. Your listening habits will dictate speaker choice, but I suggest keeping to 90db/1 watt speakers or better. Coincident's own Dynamite speakers proves tons of fun, as do the equally efficient Vandersteen 1s. Thanks to that beefy power supply and the headroom it affords, Blume tells me that he has owners with 86db/1 watt speakers report they are more than satisfied with the Mk. II's output. As mentioned earlier, this amplifier has a more robust power supply than its predecessor and offers amazing grip in the bass region, something small SETs usually lack. Even when listening to heavy rock or EDM tracks, this amplifier offers up a solid musical foundation. Where some SET designs are notorious for loose, floppy, one-note bass, the Mk. II keeps a lock on things. I was pleasantly surprised at how loud I could play Led Zeppelin and Tool before the soundstage flattened out from being overdriven. The magic is in the midrange and upper registers, and this amplifiers ability to reveal layer upon layer of musical texture is indeed sublime. Listening to the current remix of the Beatles' Sargent Pepper, which for those not familiar is a more dynamic, forward mix than even the remastered discs from about six years ago is sheer joy. With so much more information at your disposal, it's not only easier to hear all the individual instrument lines, the harmonies of the group are now more accessible as well. An equally pleasant rendition of the audiophile warhorse from The Fairfield Four, Standing in the Safety Zone is achieved with the Mk. II. Those four guys just seem to inhabit the listening space. If there was ever an excuse for the "less is more" attitude towards design, the Mk. II nails it. Making it a point to get a pair of Zu Druids in to experience what super-efficient speakers can do with 8 watts per channel, going back in time proves even more enjoyable. A recently acquired pair of mint, mid 70s Klipsch LaScalas mated to the Mk.II is some of the most fun I've ever had listening to music. Combined with the Simaudio NEO 260 CD player/DAC (purchased used in excellent shape from our pals at Echo Audio in Portland, Oregon) the entire system is about $3k. Dynamics are definitely the fourth dimension in music, and listening to some of my favorite classic rock records with this kind of pure sock, is immersive to say the least. Whether jamming out to the alarm clocks on Dark Side of the Moon, or some Jimi Hendrix, the Mk. II paints a vivid, three-dimensional soundstage that is easy to swim around in. Hifi doesn't get any more fun than this. Should you be a Klipsch lover looking for the perfect amplifier, this is an amazing choice and my personal favorite. I?ve never heard a pair of LaScalas sound better. I suspect the Mk. II would be equally great with Altec Voice of the Theater speakers as well. The only thing I didn't get to try was a pair of single driver speakers. Maybe next time. 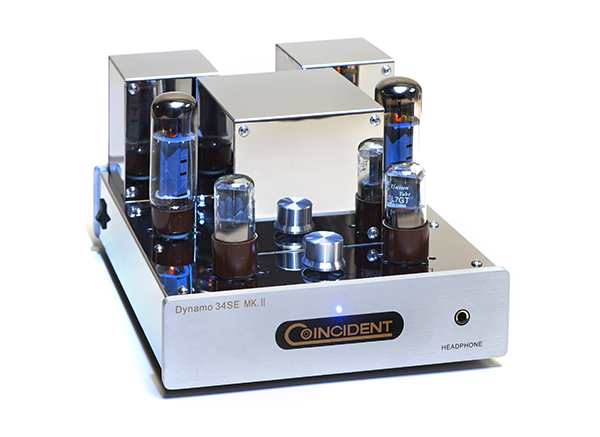 If you've got speakers that can live with 8 watts per channel, I can't suggest a more enjoyable amplifier than the Coincident Dynamo Mk. II. It offers a degree of refinement that you'd expect from a tube amplifier with another zero on the end of the price tag. Along with being robustly built, the Mk. II is aesthetically pleasing to boot. Those with a huge room and average sensitivity speakers might consider a larger amplifier from Coincident, but if you can work within what the little Dynamo can deliver, it's very impressive. 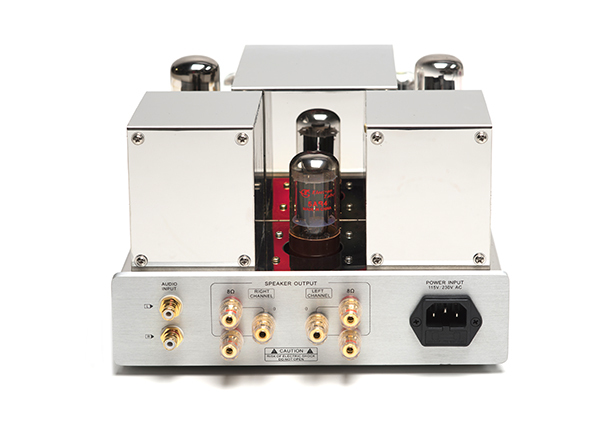 Considering that a decent, stand-alone headphone amplifier alone will set you back $1,500 these days, getting a power amplifier too makes the Mk. II a stone-cold bargain. Running through the gamut of headphones at our disposal, (Audeze, Grado, Koss, Pryma and OPPO) reveals the Mk. II has no difficulty driving any of them. Blume reveals that instead of an inexpensive op amp, the output of the amplifier drives the headphones directly, so that the output available is huge. This also gives the benefit of your favorite phones having the same sonic signature delivered to your speakers. So, if this sounds like your idea of the perfect audio joy ride, give Mr. Blume a call and tell him we sent you. The Dynamo Mk. II is highly deserving of one of our Exceptional Value Awards for 2017, and if we gave out an "Extra Effort" award, it would win that too.